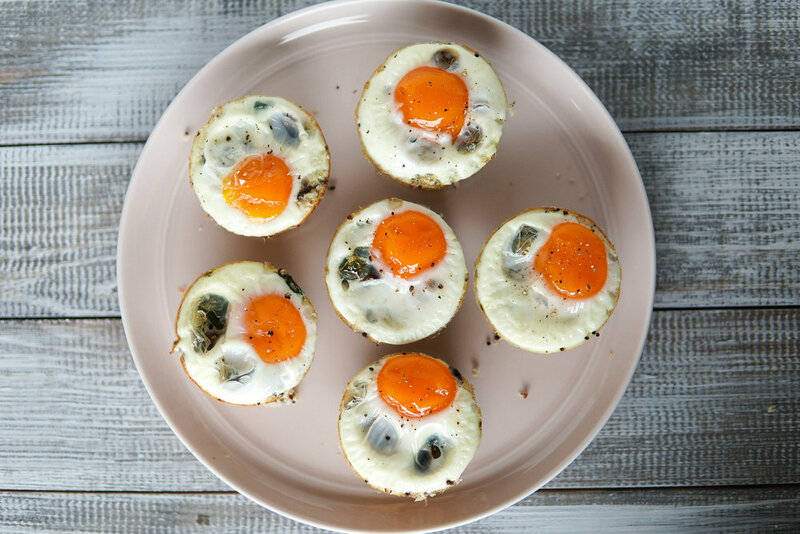 Mix up your usual oatmeal or egg breakfast with these cute little egg cups. They’re the perfect easy, make-ahead, protein packed breakfast to whip up during your next Sunday meal prep! 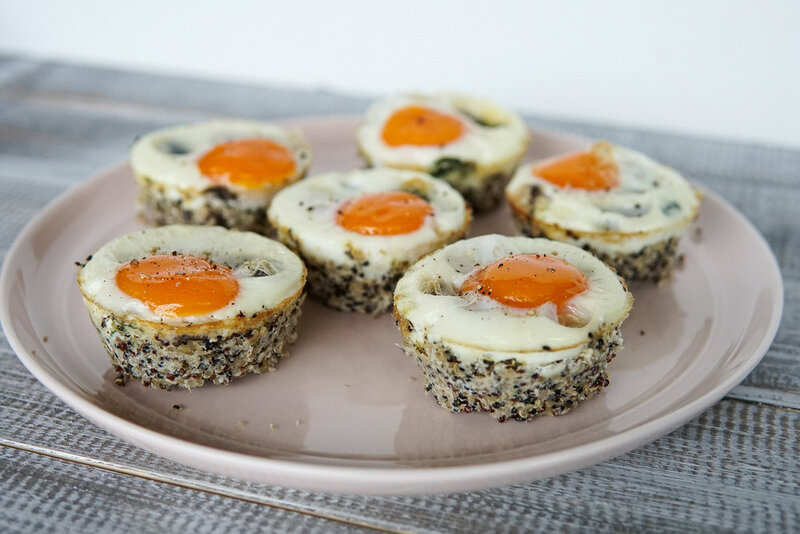 Layers of seasoned quinoa and mixed veggies topped with an egg baked to your liking! The best part? 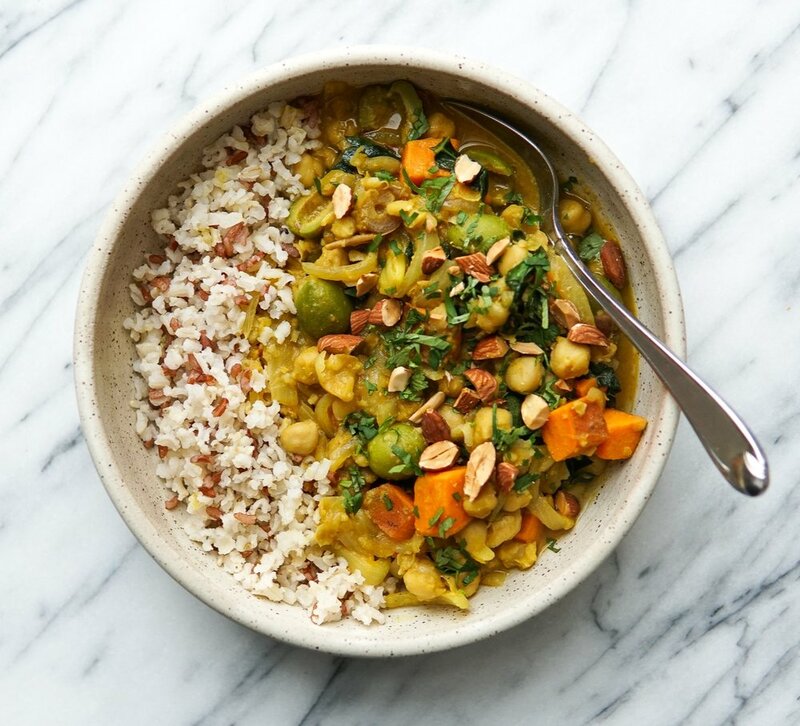 You can use any grain or veggie that you have on hand. Just follow the general instructions and you’ll end up with a delicious, customized breakfast bite! I used mushrooms and spinach but feel free to improvise with other veggies or, even better, use up leftover roasted veggies! Quinoa works great but leftover rice would work as well. The recipe makes 6 but can easily be doubled to make 12. How long does it take an egg to cook in the oven? At 350F, it will take about 20 minutes depending on the oven, size and temperature of the egg. It’s done when the whites are mostly cooked through and yolk is still a little runny. The eggs will continue to cook as they cool. If you prefer solid yolks then bake for longer! What’s a good substitute for quinoa? 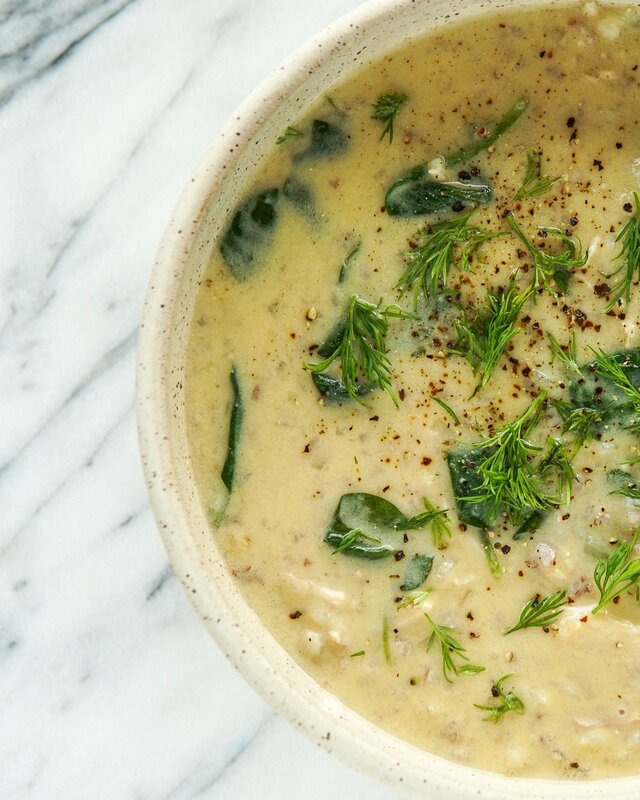 For this recipe, you can use any leftover cooked grain. Think white rice, brown rice, millet, etc… Since the grain is mixed with egg, they should hold up just fine! YES! Pasture-raised, free-range eggs are fed better diets and are just way happier than chickens that are caked up and can barely move. You’ll notice the difference in the golden orange egg yolks compared to the pale yellow most people are used to. Not only do they taste better, but those yolks are loaded with way more vitamins and minerals. My favorite brand is Happy Egg Co. Runner up is Vital Farms. Both can be found at most grocery stores. Preheat the oven to 350F. Line a 6 or 12-cup muffin tin with 6 parchment muffin cups or grease well with coconut oil. Add the quinoa to a small pot with ⅓ cup of water. Bring to a boil, then reduce heat to low and simmer, covered, for 15 minutes. Transfer to a mixing bowl and let it cool for a few minutes. Meanwhile, in a large skillet, warm the oil over medium heat. Add the mushrooms and saute until softened, about 5 minutes. Stir in the spinach, garlic and salt and cook for 1 more minute, or until the spinach has wilted. Remove from heat and stir in the feta, if using. Add the egg, oregano and salt to the quinoa and mix thoroughly to combine. Diving the mixture in heaping tablespoons between the 6 muffin cups. Divide the veggie mixture in an even layer on top of the quinoa, leaving room for the egg on top. Crack an egg on top of each one. Sprinkle each egg with some salt, if you’d like. Bake for 20-25 minutes, or until the eggs are set and cooked to your liking. Allow to cool before storing in an airtight container in the fridge. To reheat, pop a couple into the microwave until warmed through, about 15 seconds. Make sure to leave enough room for the egg on top when you’re layering the quinoa and veggies. If not, the egg will spill over and it will be a messy clean up! If you aren’t using muffin cups, make sure to grease really well or else it will be very difficult to get them out. Use muffin cups if you have them! TASTE! Make sure you taste the veggies to make sure the salt level is good. Bake the eggs to your liking. They will continue to cook a bit after you take them out of the oven. I like mine underdone with a runny yolk!